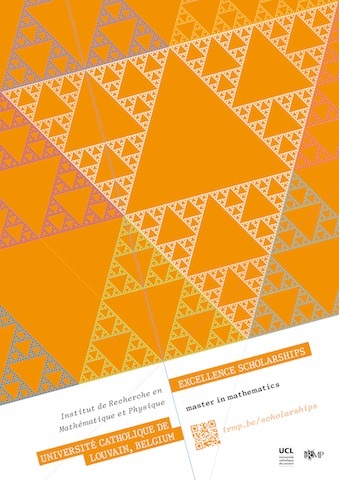 The Excellence Scholarship Programme by the Institut de Recherche en Mathématique et Physique is designed for students with a Study Diploma giving access to a Master Programme in Sciences Mathématiques or Sciences Physiques at the Université Catholique de Louvain. a €1000 prize for a master thesis to be written under the supervision of an academic mentor or a tenured investigator at the Institut de Recherche en Mathématique et Physique. Candidates will have fulfilled the general conditions needed to qualify for Master 120 en Sciences Mathématiques or Master 120 en Sciences Physiques at UCL before the deadline for submission of their application. A good knowledge of French or English is highly desirable. The Selection Committee for scholarship is appointed by the Conseil de l’Institut de Recherche en Mathématique et Physique. It is composed by three of its members chosen among the permanent members. Members of the Committee may request to be replaced if unable to participate, in which case they shall inform the President of the IRMP in advance. Scholarship awardees are selected upon evaluation of CV excellence and originality of the study project outlined in the personal statement. A recommendation letter by an Academic will also be taken into account in the evaluation of the candidate. The Committee's decision on the assignment of the Scholarship will be final and no appeal will be allowed. The €1500 grant will be paid by 31 December of the award year. The grant will be awarded upon evidence of enrolment in the Master programme, as stated in the application file. 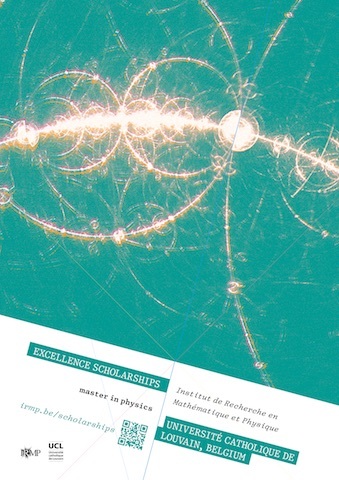 The €1000 prize will be awarded upon completion of the Master's Degree, subject to the submission of a master thesis written under the supervision of an Academic or a tenured investigator at the Institut de Recherche en Mathématique et Physique. Cumulation of the Scholarship with other awarded grants is allowed. Online publication of application Form: 1 June, 2018. Deadline for receipt of applications: 5 July, 2018 - 12:00 . Communication of results: starting 24 July, 2018. • A copy of the Diploma and an official document certifying academic scores obtained in the previous three years (translated into French, English or Flemish, if necessary). The recommendation letter by an Academic should be sent directly, exclusively by email, to the Président of the Institut de Recherche en Mathématique et Physique (president-irmp@uclouvain.be). Deadline for receipt of application files: July 5, 2018 - 12:00 (printed and online file and recommendation letter). Files received after the above deadline will not be considered.